Excellent. Much better than expected. Good acting, scenery, storyline. 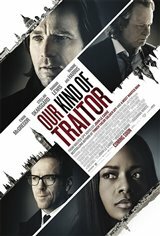 Close to the book if you like spy stories written by former spies that show a side of alit most of us ever see then you will like this movie. thoughtful, well acted and great scenery as a backdrop to the story. A great Le Carre movie. Good drama and fabulous acting. Not too much being blown up and a fine intricate plot. Good suspense without blowing up half the planet. Surprisingly it was not hard to follow. It's not a great film but is enjoyable and not boring. Acting is good and locations are beautiful. Worth seeing.